What Makes A Cottage-Style Home Different? Simply put, Cottage-style Homes are built for everyday living. Inglenook’s Cottage-style Homes are designed for the way you live. Wasted spaces, like long hallways and formal sitting rooms, are eliminated. Family spaces, like kitchens, family rooms, dining nooks, and porches are joined together maximizing functionality and space. Whether you are entertaining, hosting a holiday gathering, or going about everyday life – it works. 1. Cottage Homes place the social areas like the kitchen, family room, and dining nook to the front of the home. Private areas, such as the bedrooms, are to the back. 2. More windows and bigger windows make Cottage Homes lighter and brighter than most traditional homes. 3. To ensure privacy, cottages are designed with an 'open' and a 'closed' side. The 'open' side has large windows facing its side yard, while the 'closed' side has high windows and skylights. 4. Porches dominate the front elevation of a Cottage Home, not garage doors. A cottage porch is large enough to serve as an additional living space. 5. Inside areas are separated from the common greens by a sequence of five privacy barriers. A border of plantings, a low split rail fence, the front yard, the porch railing, and the porch itself. What Makes A Great Front Porch? Front porches greet neighbors and visitors. They serve as an outdoor extension of your living space, giving you a peaceful spot to relax and enjoy a cup of tea or a place to gather with friends and family. The possibilities for a front porch are endless. 1. Porch railings define private space from public space. And the porch railing is also the perfect palce to 'perch' a cup of tea. 2. Porches are located next to the greenbelt to allow owners to informally engage with neighbors. 3. A Porch should be large enough to function as a room. A porch should be large enough to function as a room. A place to entertain friend, or just spend with family on a warm summer night. 4. Flower boxes surround a cottage porch. Flowers and plantings provide a chance for individual creativity and, at the same time, adds a certain charm to the neighborhood. 5. The front door should be located to one side of the porch or the other. This way your porch functions as a room instead of two small spaces separated by a door in the center. While there are many other things that make Inglenook’s Cottage Homes different, the Pocket Neighborhood where they reside makes them one-of-a-kind. Ask any of the people that live here and they’ll tell you the same thing. 1. In a Pocket Neighborhood, cars are eliminated from public areas by moving them to the rear of each home and screening them from view. 2. Porches and private front yard flower gardens provide the catalyst for each family to show individual creativity. 3. 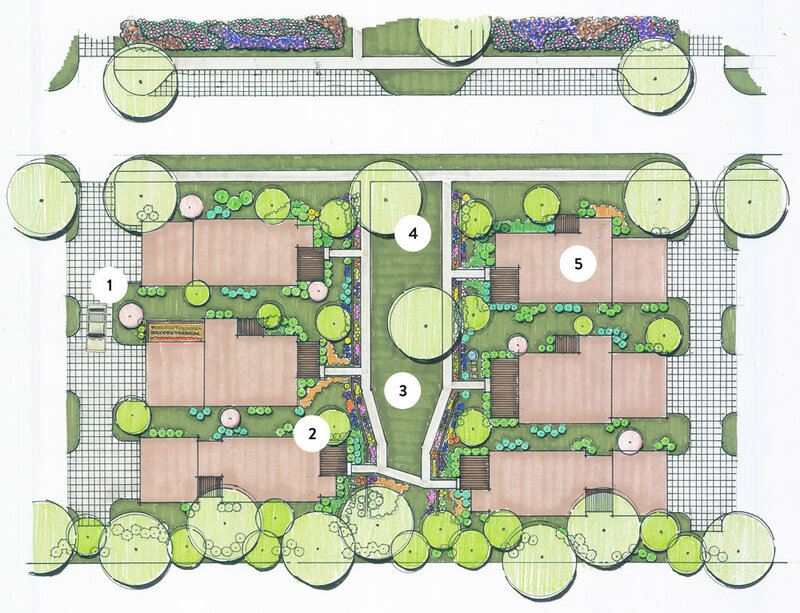 A common green space provides the platform for social interaction and spontaneous neighborhood gatherings. 4. The 'implied' gate at the street and the greenbelt itself define public and semi-public space. The shared garden, low split rail fence and porch define the semi private space. 5. With each home's porch and family area oriented toward the greenbelt, security becomes a strong network of neighbors who know and care for each other.